Do you have that favorite piece of furniture that is out of date but you just don’t want to part with it ? Maybe it has been in your family for a long time, or it is just a nice solid piece. 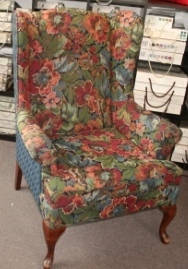 With our upholstery services you can now keep that item for years to come. With an updated fabric and possibly some new foam in the seat your outdated chair is now a beautiful current focal point in your room. Visit our showroom to see our great array of fabrics for you to choose from, from indoor to outdoor and from linens to velvet! 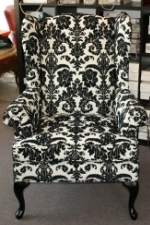 Just to give you an idea of a transformation view the chair below, this chair is in our showroom! Your options are only limited by your imagination!